Dupont Circle is a vibrant neighborhood located in the northwest quadrant of Washington DC, home to a stimulating mix of art galleries, embassies, and upscale eateries. At the heart of the community is a busy traffic circled marked by a spacious park and a majestic fountain designed by the sculptor of the Lincoln Memorial, Daniel Chester French. A handful of Dupont Circle estates date back to Civil War days providing a glimpse of the grandeur of the time. Other properties include two and three-story row houses built in the Queen Anne and Richardsonian Romanesque styles. Buyers have enthusiastically embraced the recent practice of partitioning of row houses into single floor condos with high-end finishes such as gourmet kitchens, hardwood floors and outdoor decks. 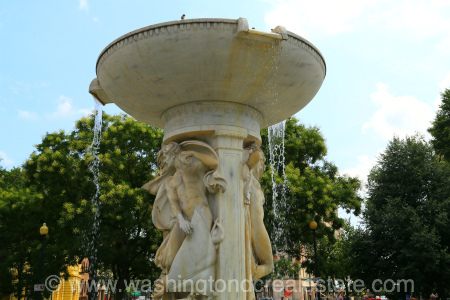 Read more about Dupont Circle real estate. Dupont Circle draws its name from a former Civil War hero, Samuel Francis Du Pont. As one of DC’s most cosmopolitan communities, Dupont Circle has long been popular with the gay and lesbian set and continues to play host to signature events such as the Capital Pride and the High Heel Race. Dupont Circle is bounded by Florida Avenue to the north, 15th Street to the east, M Street to the south and 22nd Street to the West. The Dupont Circle Metro Station on the Red Line continues to be one of the busiest Metro stations in the District.